As the nights are drawing in, (it’s dark here by 4:00pm here aaagh! ), sometimes the thought of an early evening juice just doesn’t have the same appeal as it does on those fabulous summer evenings. This week’s recipe looks to remedy this. It is perfect when you feel a little chilly, or in need of a comforting hug as you curl up in front of the fire. The addition of cinnamon really transforms a simple smoothie to completely another level. This is absolutely fabulous as it is, really comforting on cold winter nights. To give it the ‘Green Smoothie Queen’ touch add 1/2 large handfuls of spinach and blend. Mmmmmmm! So, cinnamon is the magic ingredient in this smoothie, but what is cinnamon, and is it beneficial to us? 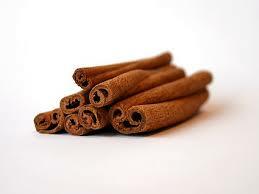 Cinnamon is a small tree that is commonly found in South Asia and the Middle East region. The cinnamon that we typically find in our supermarkets is the bark of this tree, which is either sold as the dried tubular form known as a quill or stick, or ground into a powder. Although it is available throughout the year, the fragrant, sweet and warm taste of cinnamon is a perfect spice to use during the winter months. Cinnamon has a long history both as a spice and as a medicine. may have a regulatory effect on blood sugar levels and is therefore beneficial for people with Type 2 Diabetes. has a role in aiding digestion. can help to treat diarrhoea. can help to cure the common cold. combined with honey can reduce arthritis pain. can help to boost memory and cognitive function. is useful for treating toothaches. can cureuring headaches and migraine pain. I’m just loving playing around with my juicer and blender at the moment, creating fabulously delicious smoothies from my juices, which makes them more filling and sustaining at a time of year when our bodies need more nourishment. This morning I was woken by howling winds and rain pounding on the windows – not a good start to the day! I’m seriously craving sunshine; not just for its warmth, but also its colour. This provided the inspiration for today’s juice/smoothie recipes. Juice all ingredients and savour – a beautiful orange colour with warmth provided by the ginger! Eat with a spoon from your favourite glass, and dream of sunshine! Take the smoothie above and blend with a large handful of your favourite greens – I used spinach. Top with some of the leftover juice for a fancier appearance, and to retain some of that summer glow! Reminds me of summer sun over green fields! Curl up and enjoy! Mmmmm! Carrots aren't just good for rabbits! or for providing your smoothies with orange colour, they are also an excellent vegetable, having both nutritional and medicinal values which are essential for our optimum health. They contain a very complete nutrition to provide our body with essential enzymes, vitamins and minerals. A single carrot will supply all your vitaminA needs for the whole day. 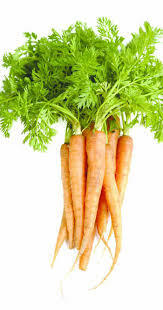 In fact, Chinese medical practitioners recommenr eating carrote to give your liver more energy! 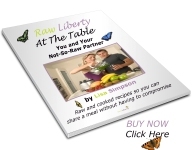 • Balancing blood acidity and blood sugar. • Keeping the optic system in good condition – we’ve all heard that carrots help you see in the dark! Chinese practitioners have said that carrots taste sweet, and are good for the health of spleen and stomach. The best thing about carrots is that they are easily assimilated by our body, especially when blended or juiced, to break down the cell walls. So try adding carrots to your juices and smoothies, enjoy their colour and taste, and relish the fact that you are nourishing your body optimally at the same time! Massage the hemp cream lovongly into the kale until it is thoroughly coated. Spread on a dehydrator sheet and dehydrate at 105' 'til crispy. They will keep well in an airtight box, if you don't eat them all in one sittin that is! It's also delicious when soft and warm - I couldn't resist trying some straight from the D! The hemp cream is also delicious as a dressing for salads, a bit like mayo, or used as a sauce for spiralised courgette! Enjoy!